I was in HC-7, Atsugi, Japan. 1970. There was a Japanese company on the field. They overhauled A-4 and CH 46 aircraft. The Air Force would fly in CH-46's from Vietnam in C-124's. The tail section was taken off at the production splice just aft of the stub wing. As I recall they were upgraded to D models. The tails were put in a field across the road from the HC-7 hanger. I did take a short piece of stringer out of one for a corrosion repair in one of our UH-46's. Should of took a picture of that field then. FLEW IN H46'S FOR 8 YEARS HC3,HC6 HAD 1000 HR PIN AND CERT. HAD EVERYTHING STOLEN A FEW YEARS AGO AND WOULD LIKE TO KNOW HOW TO REPLACE THEM IF POSSIBLE. I flew as a crew chief with HMM-265 in Vietnam 66-67 after transfer from HMM-161 crewing UH-34Ds. I recall all the recon insertions coming hot using a pedal turn and applying HOVER AFT like a speed brake. The aircraft experienced a tremendous amount of vibration and stress to the field splice at frame station 410. I flow both A and D models in my 8 years in the Marine Corps. Survived 2 crashes with Hard Landings causing the Aft Pylon to nearly separate. One of the crashes was in the water off of Corsica ripped the ramp off, broke fuel line to #2 engine and flamed out. In both cases the PHROGS held together. I worked for Columbia Helicopters as a mechanic and in avionics. The only thing more brutal on the airframe then HOVER AFT is logging. Columbia Helicopters has perfected methods of reducing the stress while logging and other external loads. HMM-265 was issued the aircraft 50 cal MG in the summer of 1966. The M-60 MG wasn't effective against reinforced grass huts. Crewed on the CH-46 which was assigned to USS Enterprise during the fall of Saigon April 1975. We as well deployed a Marine HMM outfit forget the Unit #. I still recall one of the placards on one of the birds, "Snoopy's Saigon Express"
CH-46F, were not "Withdrawn from service. ", they where updated to E models. I was with HMM-262 from 81-84 in 82 we exchanged are 12 F's for 12 E's. The CH-46F BUNO where 154845 to 157726. CH-46E, models where not a production aircraft but update from late A's, D's, and F's. I did OJT with Phase Crew HMM-163 in 1999. Then went on to CH-46 FREST where I learned to completely tear down the T58. Finally stationed with MALS-36 on Oki working with HMM-262 and HMM-265! Semper Fi! In regard to armament: when HMM-265 deployed to Vietnam in 1966, the aircraft were already equipped with gun mounts allowing the use of either M-60's or M-2 .50 Caliber machine guns. We generally were armed with, and preferred, M-2 .50 Cal's. I worked for Boeing ,was on a special assignment CH-46 Mod.program in Okinawa in late 1967. Purpose was modification and beef up Sta.410, and aft repair due to battle damage.--Anybody uot there that was on this assignment??? I was a crew chief with HMM-262 and deployed to Vietnam in Dec. 66 with the A model. I transfered to HMM-164 in Feb. 67. We received the D model later that year. I served 19 months in combat and flew on over 300 missions - From the Battle of the Hills to the Tet Offensive to the 77 day seige on Khe Sahn. I have written a book about my time in-country. It is entitled - Flying Death The Vietnam Experience. It is a different prespective of the war as seen through the eyes of a combat helicopter crew chief. The CH-46 is one of the finest helicopters ever built. Its' history speaks for itself - In Service for almost 50 years. Anyone know HC-46 pilot, John Kennedy, USN, 60'-80's? Flew them in Viet Nam in 69-70 with HMM 263 at Marble. Aft pylon departure was a thing of the past by then, although not many pilots in our squadron above the rank of Lt. think about that. I wrote a book about being a crew chief on a CH-46, deploying to Vietnam with HMM-262 and HMM-164 in Feb 1967. I flew over 300 combat missions and awarded 16 Air Medals. The book is entitled, Flying Death The Vietnam Experience. I have gotten great reviews by those that I flew with in combat. What was the colors on the outside and inside ofhe CH46A while in combat service with the Marine Corps in Viet Nam? Having flown mucho hours in the 46, Al Powell is absolutely correct in stating that the station 410 separation was due to misuse of "hover aft". When I was NATOPS O, a pilot I was cheching who needed a yearly stan ride slammed us into the runway during a poorly performed auto salvaged at the last second. We bounced off the tarmac, set off all three over torque balls on the tac resulting in the bird being gone over with a fine tooth comb for overstress. Station 410 was solid. So much for the "hot" approach theory (probably sounded good in the O Club). In response to the comment about never having 7.62mm machine guns in the crew chiefs door, if you go to the website of HMM-364, you will see photographs of twin M60's and later a minigun that was supplied from the Cobra squadron next door mounted in the door. True, these were not factory mods, but squadron level mods. There is also a photograph(s) of the original stinger setup that we used on the ramp of a 46. Hope this will help clarify the issue. Brought me home over 200 times. I have finally got a loan of 20,000USD from universal Lendering, after many years that l have been looking for loan. I am so happy. You can contact then at universal_lendering@yahoo.com. I am so happy. I recently spoke with someone who was in vietnam in the early 70's. The topic of helicopters came up and he said that he flew in them many times. then he said that "our next door neighbors sold the helicopters." does anyone know what he meant by this? thanks for the help! Possibly there were two Ford commercials however one commercial was with a 65(?) Mustang being externaled and put down on the Wall Street Pier, New York. The 107 is a New York Airways a/c and crew; one of a fleet of seven. Misplaced my 1,000 hr pin, 4 Rescue Pins. Anyone know where I can get them replaced, please respond. Great aircraft. Spent many hours on Stbd-D. I flew with CH-46E's with HMM-162 from 1979 to 1984 and HH-46A's and D's at MCAS Beaufort SAR from 1984 to 1988. We converted our HH-46A's with ASE/SAS to HH-46D's with AFCS while I was there. I ended up with 2500 hours in Phrogs and 500 hours on CH-47D's. A member of HMM-164 Nov 1965 to Jan 1967, first 46 Sqdn in Vietnam. Aircraft Maintenance Officer HMM-165 1992-1996 thirty one years later. I flew every opportunity I got. She is a fine aircraft, but not without her problems. Early on, blade issues, then the 410 station issues, hover aft, and so forth. The glass cockpit of the echo models is sweet. I could go on for hours. Nice to read all of the comments. Semper fi! I flew the ch46 from the Philadelphia Pa, Boeing Vertal plant in 66/67 era as aircrew (E5)in VRF31 (Naval Ferry Comand)with one pilot and one crewman(I flew left seat---"flight school" was OJT). We moved them from the factory to California for deployment to Vienam. One of the greatest thrills of my then young life, I'm now 65 years old, it is amazing to me that this design has served for so long and so well, a testiment to some great design work early on. 1979-1988 Racked up 3000 hours in 46s.. Would gladly trade them for this P.O.S. 60 any day of the week.. 46 is so much more maintenance friendly and a whole lot more reliable!!! flying in CH46A and D Models. (H)New River with HMT-204 and HMM-263. The CH-46 has already been phased out there in favor of the new V-22 Osprey. I have recently saw pictures of E model CH-46s with the SAR Squadron in Cherry Point and giving these old war birds a new life and keep them out of the bone yard. During the 70's I recieved a 1,000 hour patch, certificate and pin from Boeing-Vertol for my service as an H-46 Crew Chief. I still have my certificate but I've lost my patch and pin. Can anyone tell me how I might replace these two cherished items. I was on board the USS Moount Hood AE-29 from 1974-1978 and there was two uh46d/ch46d sea knight helicopters on board ship. I would like to know what Hc# and what detachment# we had onboard. And what naval air station in California they came from. Having flown over 4000 hours in every model of the Phrog, I can assure you that the tails breaking off on landing was not the result of hard landings. The cause was the pilots flying in to hot LZ's would switch the AFCS system into the "Hover Aft" setting which was designed to enable the 46 to maintain a level deck attitude in a hover. The flight manual stated that the Hover Aft mode should not be selected above 30 kts. This action placed excess stress on the 410 bulkheads was not designed to take. The "Sigma 1" conversion replaced the tail and included an airspeed interlock to prevent the selection above 30 kts. After the conversion the only way the pilot could defeat the system was to have the copilot cover the Pitot tube to trick the system. The side flare maneuver is a way to stop without having excessive pitch change, the Navy used the maneuver extensively for VERTREP operations. The CH-46 in RVN operations was exposed to sever operational circumstances that resulted in handling situations that were very harsh. The aircraft handled these conditions pretty good. But every time an accident occured with a separation of the aft pylon there was a related rotor or drive system anomally (some involved maintenance oversights)that caused significant rotor blade damage and rotor unbalance. This rotor unbalance caused sever lateral loads that caused the aft pylon structure to fail. The modifications that were made at the Okanawa mods were helpful but would not prevent aft pylon loss given a rotor significant unbalance. The installation of the ISIS blades and transmission improvements were the more significant changes. The new tail that was installed was to accomadate the 4-point mount aft transmission. With the composite rotor blades installed and other dynamic component improvements that were subsequently made allowed the aircraft's life to be greatly extended. Remember the aircraft model is almost 50 years old and still performing its assault mission requirements better than any other available helicopter. Thats why the speedy MV-22 is required to replace it. During the Vietnam War the Marines also installed a 7.62mm machine gun, which was fired through the cabin door. Not true we flew them with M-60's early in Viet Nam (7.62mm) and switched over to the .50 cal guns in late 1967 early 1968. Also, they were never fired through the door, the port gunner fired through the removable escape hatch and the Crew Chief (starboard side) did the same. The door was kept clear until much later when fitted with a hoist on some models, prior to the hoist being fitted to the out side of the entrance door (late 70's early 80's). We flew CH-46A's in Viet Nam until they were replaced with the more powerful "D" models in 1968. By the end of 1968 all the "A"'s were retired or converted to "D" models. A close friend of mine flew as a flight engineer in a CH47 in Vietnam. For the number of hours that logged, he receievd an award from the Vertol Corp. Unfortunately, an bitter soon to be ex-wife threw out all of his military awards, this one included. Its the one he is most proud of. Anyone have any ideas on how I might get a replacement? Thanks for you help and your service. Regarding the 107 lift capability, the Ford commercial was shot using one of Columbia Helicopters'107s. The 107's we use are stripped down and we can generally lift 10000 pounds at sealevel/standard day. The load used in the commercial weighed 4500 pounds. As to the tail on the A models, I flew the UH46a and D in the Navy during the late 60s. Part of the problem with the Marine tails stemmed from the former H34 tactic of coming into an LZ fast and then putting in a huge flare to slow to touch the tailwheel down. With a tandem rotor configuration, doing the same thing had a tendency to wash out the aft rotor as you rolled forward, which caused the tail end to lose lift and drop like a rock. The cure for that was to use side flaring which we use now in logging to great effect. You can't pick up 30000 lbs with a 17000 HH-46. A 47 may do it and holds 45 troops, an H46 holds 15 troops and 4 crew. 3500 lbs is about max on a lift. more when low on the 2 hours of fuel we had. Ford shows a phrog or CH-46, or a 107 civilian model, and says the helo is dropping 30,000 pounds into the cargo bed of the Ford pickup. I do not think a phrog will pick up 30,000 pounds external. I may be wrong but would love to find out? The comment about the CH-46 being brought in too hard and breaking requires some clarification. The problem arose from Marine pilots who would (under fire, understandably!) want to come in with the ramp down so the troops would disembark quickly. The ramp would strike the ground or at times be backed into a shallow water and as a result exceed the structual limitations of the fuselage and weaken the tail section thus "breaking the tail off". The ramp on a CH-46 is a separate piece attached directly to the last fuselage former whereas on a Chinook, the entire rear or Aft Fuselage is a separate section (46 section)which includes a former to which the ramp is attached as part of that structure. A large modification program was carried out in Okinawa in 1968 during which the original tail section was replaced with a more beefed up tail which also had a new aerodynamic contour to the tail. 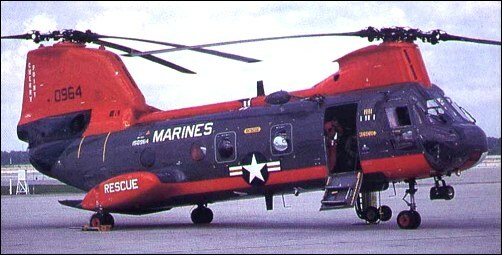 This problem with the tail, to my knowledge, never happened on the UH-46 Sea Knights because they were used for VertRep duty (and not flown by Marines in combat) and instead used to lift and transport cargo from shore to ship or ship tp ship (thereby VERTically REPlenishing the ships' supplies). It is a testament to the great designers at Boeing-Vertol that CH-46 and 47 helicopters made in the early 1960's are still flying and with greater performance now than when they were originally built - a little known fact is that today's CH-47 Chinook can out run an Apache helicopter. I wonder if any records or photos exist of Vertol providing a test 107 aircraft to evaluate for Texas Tower support to replace the H-21s performing this duty in the 1960 era. This was at Otis AFB, Mass. I was on one for a test flight, and as I recall, the only reason that Vertol didn't get the contract was that Sikorsky could provide the aircraft required sooner. I am interested in a 3d model of this helicopter for my study.can u guide me from where can i get this model to add into my presentation and show animation using this 3D model. Flew in a CH-46 in VietNam. Never see much about them on TV. Would you please write me back with info. on how I could get some VietNam era pix or souvenirs of this life-saving aircraft. Thank you for what you do. We are trying to send you an email. Won't go through. The 46D models were nicknamed Iron Tails. Some pilots would bring the A models in too hard, break the darn thing in half, so Boeing fixed the D models to where they could handle the extra stress. If you want to send an email just replace '(@)' in the address with '@' !